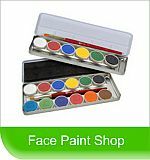 I offer 50 face painting designs for boys, girls and adults. I arrive in costume to face paint at your event. I can paint 15 faces in one hour and I also offer balloon twisting and fresh fairy floss. Please check out my facebook page Glitter Crystal Face Painting. Glitter Crystal is dedicated to providing a quality service that offers face painting, fairy floss and balloons. Glitter Crystal hopes to pass on smiles, as they are contagious. Glitter Crystal is fully insured, has a current working with children and also has a criminal check and are available to you upon request.